Having discussed Ryght’s Butterfly speaker last time, we are now able to introduce you to its little brother the Y-Storm. This small tin of music might prove to be a worthy competitor for its fancier bigger brother. When it comes to the appearance of the Y-Storm it reminds me of a tin of hair wax and might not be any bigger either. Even though the comparison might not be the most positive one, the speaker still looks solid and as a small piece of interior design instead of an actual ‘speaker’. Whilst the description does not indicate an added subwoofer in the small, yet fancy Y-Storm it feels like it packs a harder punch than its bigger brother, the Butterfly. When turning up the volume you can easily feel the bass and not that much sound quality is lost when turning up the volume. The device only has 3 buttons, except for the power switch, and does not any more to function perfectly. The buttons indicate either play/pause or volume up/down or the ability to skip songs. A lot of other settings can be done on the device its connected/paired with. 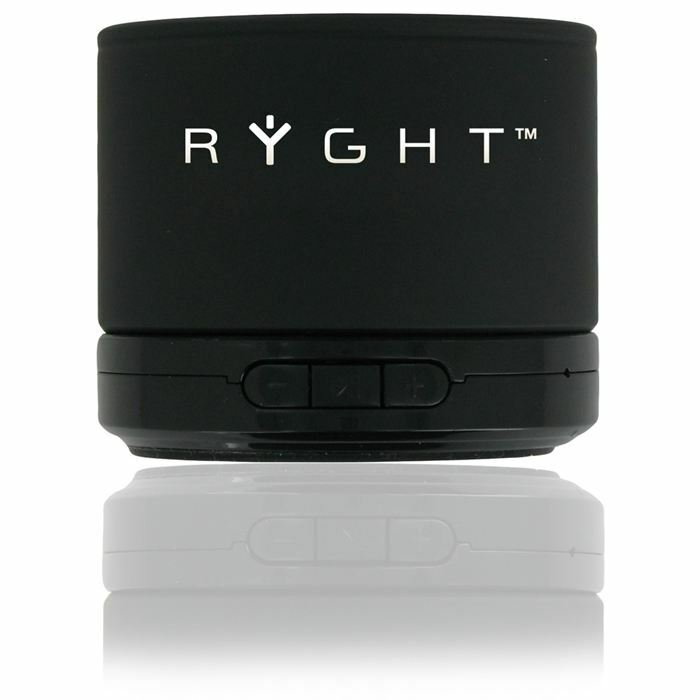 Again Ryght’s product is a matter of pairing up with your Bluetooth device and you’re all set. Creating a gap between the Bluetooth device and the speaker is also just as good as the Butterfly. You won’t experience that much issues in having it several meters away from the transmitting device, except if you have several walls in between, blocking the signal. For those who lack a Bluetooth device or those who simply want to hook up a handheld or an mp3 player and so on, there is a cable provided with standard jacks. Once more, a nice addition. Decent battery life is something the Y-Storm tends to deliver. It’s easy to say that the device will last more than several hours when you keep on streaming music. When this little ‘tin of wax’ runs out of steam you’ll be able to recharge it with the provided USB-cable. Travelling with the Y-Storm can turn out to be a delight. Especially considering hot days and so on, this might be something ideal to bring with you to the beach or simply your backyard. It’s compact to carry around, considering its size is roughly 5×6 centimeters. This small and simple looking speaker surprised me with the sound quality and the actual punch it packs. Whilst the device is roughly the same size as the Minibuddies we discussed earlier, it pack an even heavier punch. Of course you’ll have to keep in mind that the Y-Storm costs a ‘lot’ more compared to the Minibuddy. A wireless speaker is one of those things that should be easy to carry around and to be honest they don’t come much smaller as the Y-Storm. The speaker is easy to carry around, it will take up hardly any space, isn’t that heavy and still provides you with the sound quality of a full blown speaker. If you happen to be on the road much or simply have a lack of space to set up big speakers the Y-Storm might be a small piece of power for you. The Speaker delivers in all aspects needed for a practical wireless speaker. Even though this little piece of hardware comes with a decent price it will not disappoint, especially when looking at products roughly the same size. Venom launched the Nighthawk Chat Gaming Headset!